There is lots of variety of lighted collars out there, each with their own unique features and qualities and we have looked at a wide range of collars to suit all budgets. We have listed our best picks in the comparison table below. USB Rechargeable LED Dog Collar USB Rechargeable. 3 Modes - Steady, Rapid Flashing or Slow Flashing. No Catch Lifetime Guarantee. Great-Dealz LED dog Collar Visible up to 1000 feet. Powered by CR2032 Batteries. Constructed from Excellent Quality Nylon. ITERY Waterproof LED Dog Collar Waterproof Adjustable LED Collar. Rechargeable Collar by USB Cable. Can be used in Rainy Days. Clip on Dog Collar LED Lights Compact & Effective Clip on Light. Durable and Long Lasting. Water Resistant & Lightweight. Avoiding Trips & Hazards – The lack of visibility at night time means you might trip over objects in your path or catch your foot on the curb. Being able to see where your dog is and what they are doing can indicate objects and barriers in your way. In this regard, a LED Collar-wearing dog becomes a ‘guide dog’ for your safety at night time. LED collars work great on their own or in tandem with a reflective dog vest or harness. Avoiding Road Traffic Hazards – One of the most dangerous problems when out dog walking are nearby roads that your dog might encounter. 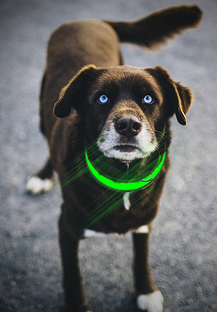 A LED collar can mitigate some of the risks by alerting drivers of the presence of your dog if they are on the road. Your safety is also improved if you are walking across the road with your brightly lit dog reducing the chance of being hit by a car. Finding your dogs poop in the darkness to clean up. Alerting other out and about to the presence of your pet potentially avoiding startling other dogs and owners out and about. We have looked at a range of LED dog collars and picked out the best of the bunch for our comparison table. 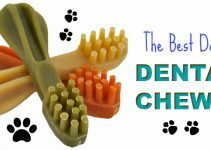 We have looked at the advantages and disadvantages of each collar and weighed them up against the price. If we feel the collar represents excellent value for money, then we will feature it in this article. The Illumiseen LED Dog Collar will give you optimal visibility and safety from all angles then this is the collar for you! The Illumiseen sits in the middle of the budget range, and it comes with a lifetime guarantee so it should last for a long time making it a good long-term investment. General construction is good, and it is evident this collar is well made. 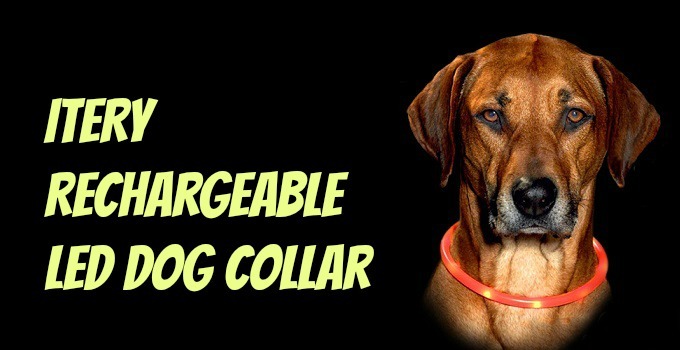 The collar is comfortable, fully-adjustable and user-friendly. The collar is rechargeable via a USB connection in which the cable is provided – This removes the need to worry about replacing batteries and makes thing a hell of a lot easier. A single charge will last you for many walks. 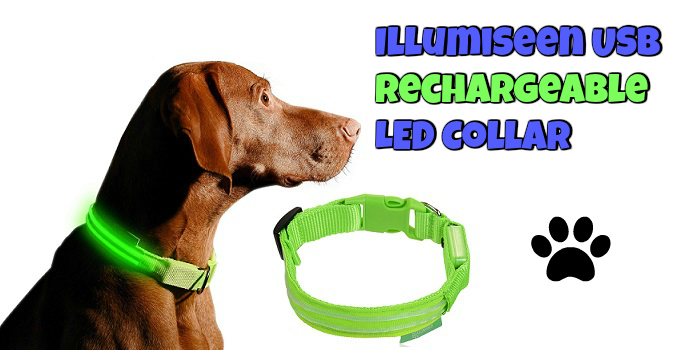 Illumiseen also makes a range of LED Dog Leashes that are designed to work well with this collar. The Leashes and Collars have the same colors making a pleasant match. USB Rechargeable – 5 Hours of illumination provided from a 1-hour charge. It will give light for many walks. 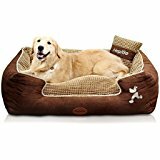 Fully Adjustable – The Collar comes in a range of different sizes to suit all breeds and is fully adjustable for a snug fit. Lifetime Guarantee – Peace of mind provided with a full guarantee. If this collar breaks of falls to bits, get your money back! The Illumiseen LED Collar is available in a range of different sizes to suit all breeds of dog. 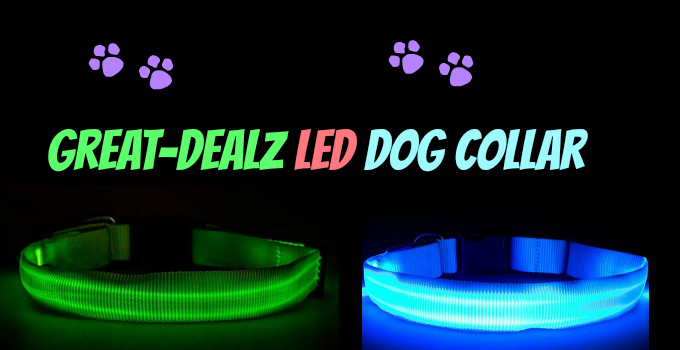 Great-Dealz offers an excellent LED collar at a lower price that will aid you to keep a close eye on the whereabouts of your pooch in low light. This collar might be cheaper than others, but it is a decent quality design and is made from a high-quality nylon material. It will be a long-lasting investment if you take good care of it. Unlike some other collars – This collar is not rechargeable and runs from standard CR2032 batteries that are easy to source. A set of batteries is provided as well as a spare set and they typically last 60-80 hours. There are four modes to choose from to increase the visibility at night time. Off, Solid Light, Flash Blink & Slow Blink. This LED collar is too heavy to be suitable for miniature breeds of dog. The colors that this collar is available in are unique and unusual. Water Resistance (Not Waterproof) – Suitable for rainy days but not swimming. Long Lasting Batteries – Powered by standard CR2032 button batteries that typically last 60-80 hours. Nylon Construction – High-quality Strong Design designed to last. The Great-Dealz LED Collar is available in a range of different sizes to suit all breeds of dog. If you need a semi-waterproof LED dog collar, then ITERY have you covered. The ITERY is waterproof and LED rechargeable dog collar that looks more like a necklace rather than a traditional banded collar. The collar is fully chargeable with a USB cable that comes supplied. 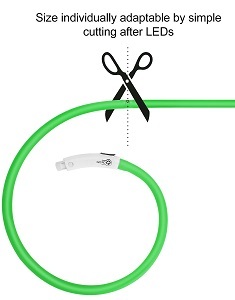 The collar comes in a single size but can be adapted to different sizes by cutting with a pair of scissors. 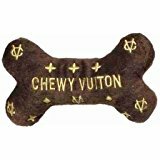 This means you ensure a snug perfect fit around your pet’s neck. The collar is waterproof, but it is not recommended for swimming or full submersion, however, is fine for rainy days. Overall a good choice if you do not want to spend a lot of money and is a lightweight necklace style option for your pet. 3 Light Settings – Slow flash, Quick Flash or Steady Glow easily set with a button. 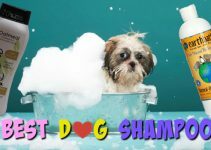 Adjustable – The default length is 27.5 Inches, but you can cut the collar to the perfect length for your dog with a pair of scissors. Fully USB Rechargeable – USB cable provided keeps the collar charged up. Use a laptop USB port or a smartphone charger to provide power. Powerful LED Lights – The LED’s ensure your dog is visible for up to 500 meters depending on the lighting conditions. The ITERY LED Collar is comes in one model that is fully adjustable by cutting to size. We hope this LED Dog Collar guide has helped you in your quest to find the perfect led light dog collar for your pet. 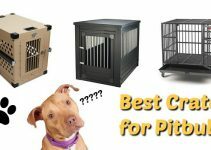 We have introduced LED collars to you and stated their benefits and advantages and listed them in our top picks comparison table so you can make an educated decision. Please leave us some suggestions and comments below.